SKOWHEGAN — A bicyclist was taken to the hospital Friday afternoon after he was hit by a car in the parking lot of Beverage Mart on North Avenue. Clifford Corson, 48, of Skowhegan, backed into Abben Poyington, 24, of Skowhegan, with a 1998 Jeep Cherokee. Poyington was walking his bicycle through the snow and ice covered parking lot, according to Skowhegan Police Chief Michael Emmons. Emmons said that Poyington was in the SUV’s blind spot and that Corson was probably going about 5 mph when the accident happened at around 2:30 Friday. “He backed into him, causing Abben to fall backward into his bicycle,” said Emmons. Corson said he went to the Beverage Mart to get a few things after Thursday’s snowstorm had kept him inside all day and the parking lot was crowded. He said he didn’t see Poyington behind him. Poyington was taken to Redington-Fairview General Hospital with minor injuries that included a swollen left ankle, said Emmons. 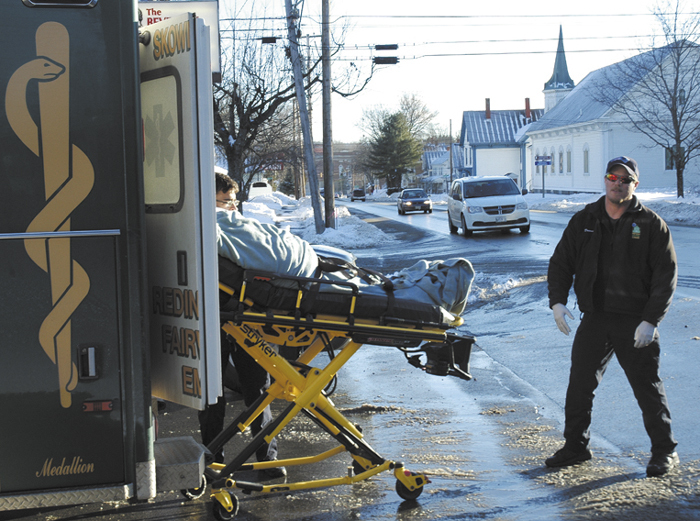 A nursing supervisor said he was in good condition Friday afternoon. He was still being assessed in the emergency room. Emmons said there were no charges against Corson and that bicycle accidents in the area are unusual. “We don’t see bicycle accidents very often, especially around this time of year,” said Emmons. Redington-Fairview Emergency Medical Services, the Skowhegan Fire Department and Skowhegan police responded to the call.